Mega Sale! 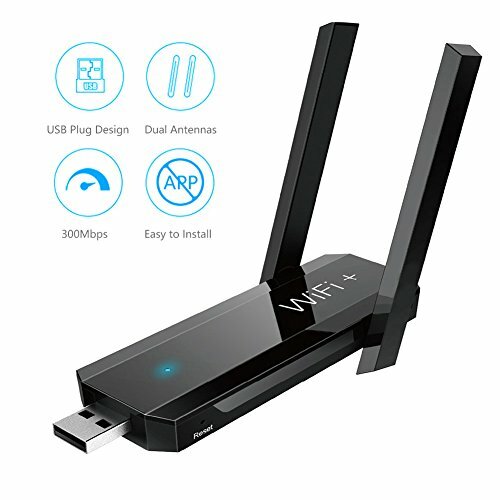 Save 27% on the USB WiFi Range Extender, WLAN Repeater 300Mbps 802.11n Wireless Repeater, WiFi Signal Booster with Dual Antennas, State Indicator – Easily Set Up by tesha at Pacs BG. MPN: WE-B01. Hurry! Limited time offer. Offer valid only while supplies last. Extend Wi-Fi Network Coverage: The WiFi repeater is designed to extend your existing wireless network delivering up to 300Mbps for whole-home coverage, eliminate Wi-Fi dead zones in hard-to-reach areas like basements, upstairs bedrooms or outdoor areas. Work with Various WiFi Router: Compatible with TP-LINK, Netgear, Dlink, Arris and other universal routers, Comcast / Verizon / at&t / Sprint / T-Mobile Gateways and other cable modem or IPTV boxes, etc. Ideal for Home, Travel, Public Use. Compact Design & Great Performance: With two high-gain external Omnidirectional antennas. Powered by any 5V/ 1~2A power adapter, such as phone charger, USB power strip, wall charger, travel charger, power banks and etc. Wireless N and High speed transfer rate up to 300Mbps. Easy to Install and Set: Plug the wifi extender to any USB devices; Connect to"Wifi+", input "usbwifi.cn" in the browser; Choose the network which needs to be extended, and enter password to complete setting. What you get: 1 x USB Wi-Fi Booster, 1 x User Manual. 18 Months warranty, 30 days' money return guarantee, 24 x 7 email support. If you have any questions about this product by tesha, contact us by completing and submitting the form below. If you are looking for a specif part number, please include it with your message.